There’s been a lot of debate about what killed Backfence, the hyperlocal news site. Was it poor design? Lack of incentives for users to generate content? Bad business model? Maybe all of these contributed. But what really killed Backfence was Google and Web 1.0. 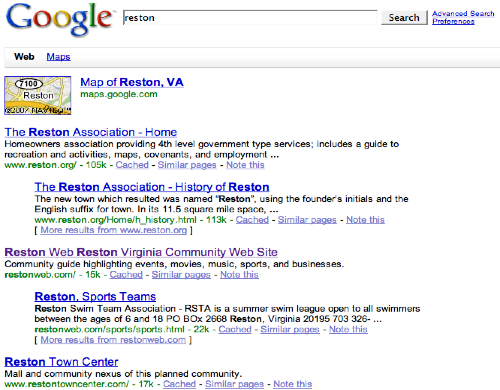 The second result is Reston Web — the Reston Virginia Community Website. 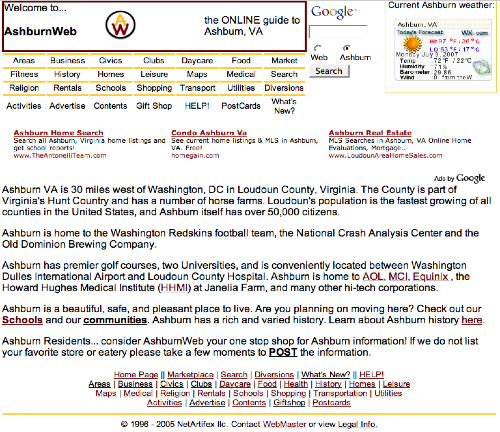 Holy Web 1.0, Batman! What is this thing? Apparently, it’s a thriving community website, and has been for quite some time (hence the high Google ranking). If you check out the old fashioned bulletin board, you’ll find a thriving community, i.e. all of the people who never discovered — and never needed — Backfence. 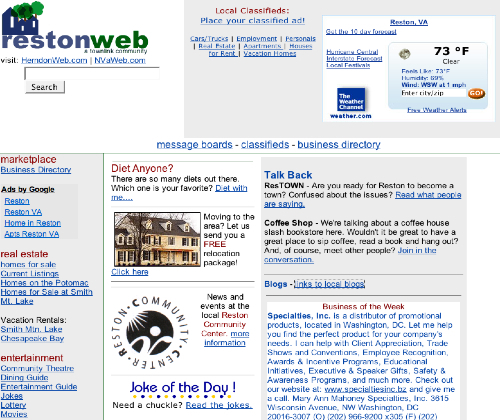 Sure Backfence had rounded corners and other Web 2.0 spice, but it turns out residents of Reston don’t really care about that stuff — nobody does. The Google search results for Backfence localities also includes community centers, home owners associations, and other community hubs that long predate Backfence. And where is Backfence in Google? It’s there, usually on the second page (where no one could find it), sometimes on the bottom of the first. Hyperlocal is about “community,” sure, but on the Web it’s more about utility — hyperlocal is where we lead our daily lives and all the things we need to get done. We need to know where to live, where to find the zoo, where to eat out, where to play golf, where the local YMCA is, and where to see a dentist. 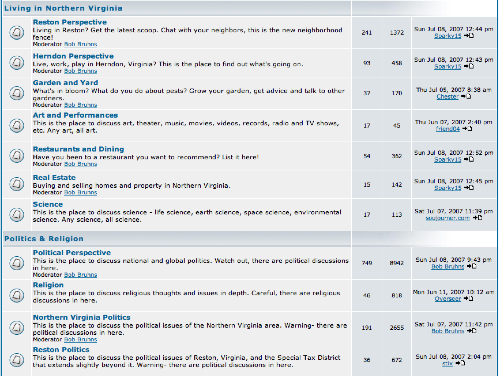 The problem with all the thinking on hyperlocal is that it’s focused on what we think people need, i.e. more local news reporting, not what they want, i.e. help getting things done — web publishers figured out 10 years ago how to give people what they want, and then Google stepped in and took care of the rest. That doesn’t mean that hyperlocal can’t evolve in the 2.0 era — but it needs to do so with a keen understanding of how the Web works, and not a nostalgia for how local newspapers used to work.